Rob Wright won the East Midlands Winter League match. 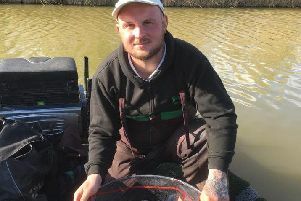 This season’s East Midlands Winter League has been building up to one of the most exciting finishes we have had for several years and after Sunday’s penultimate round there is still plenty to fish for. The Old Nene at March turned out to be the perfect venue with all but the windswept bypass section producing some very good weights. On the individual front the hot pegs close to the March town centre bridge was the place to draw. The high banks sheltered the anglers from the worst of the weather and that was reflected in the outstanding nets of fish put to the scales. First place went to Rob Wright, who started the match well fishing the deeper water with bread punch. As that swim gradually faded he switched to a slightly longer line with hempseed which turned out to be equally productive and he finished with a flurry putting a very impressive 26lb 15oz to the scales. In second place was Reece Hern. He was a few pegs away from the winner and caught on the whip and short line with bread punch to finish with 20lb 5oz. March rod Alex Bates came third, again in the same section as the top two, and like them fished bread for 19lb 2oz. Once the individual places were sorted out it was down to the main event of the day, the team places, and it could not have been closer with just section countback points separating the top two. Taking the honours was Stanjay Tackle from Godmanchester with 27 points. Runners-up were Maver Image, again on 27 points, with Browning Hotrods third on 29 points. But the battle for the last remaining place in the final will go right down to the wire as Maver Image have 12 points, just one ahead of Stanjay Gold. The last match is on Factory Bank, the Old Nene at Benwick and a couple of sections on Raveley Drain. Sunday saw round one of the Tony Evans Winter League fished on the Horseshoe and Beastie lakes at Decoy. The draw was all important and with a strong wind blowing across the fishery the hot pegs turned out to be the low numbers on Horseshoe. Top rod from peg two with 97lb 5oz was Billy Smalley, who caught well all day fishing the pole with both pellet and red maggot. Second on peg 12 was Rob Goodson. A difficult wind saw him catching a few on the feeder, then a switch to the pole with red maggot, back on the feeder and finally a good late run on the pole close in saw him put 96lb 3oz to the scales. The Carrot Wash section of fenland water just up from Pondersbridge has been in really good form recently and in the latest Whittlesey AA club match John Taylor put a very respectable 13lb 13oz of roach and perch to the scales to take the top spot. Second, again with an all-silver fish net, was Frank Bevilacqua with 7lb 8oz and in third place came Jeff Tuttlebee with 6lb 5oz.